So last week I gave a glimpse of some of the stuff that will be happening on Tuesdays. To recap, this isn’t quite a review, review segment. The best way to look at this is as an opportunity to explore stories in their many forms. Our tradition for stories can be traced back to the dawn of civilization and the stories recounted around the camp fires where we came together even as primitive creatures. In this space we will spend some time exploring stories, in a number of mediums. As we saw recently, the medium was the graphic novel The Shadow Hero. Tonight we are going to explore the idea of story through not only another graphic novel but also a movie. As you will see, we will not only explore the various components but also how the interactions affect our experience. 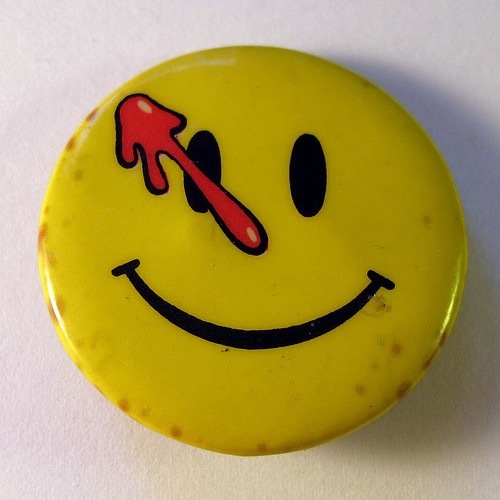 When the graphic novel The Watchmen came out, it had done something huge. The story had broken through the barrier of what constituted pulp fiction into literature. Here is the thing that is lost in the shuffle. The story was originally published as a traditional comic book and then collected into a compilation that was sold under a new name (graphic novel). The original comic series had been published by DC comics in 1986 and 1987, written by Alan Moore and illustrated by Dave Gibbons. But if it had remained simply as the comic books that it originated as it would have been lost in time and obscurity. Instead in 1987 the individual comics were compiled into a full volume. It was around this time that DC also released the collected run of a comic by Bob Kane. The Watchmen and The Dark Knight Returns were both gritty and dark stories that took the legends of super heroes into new territory. They also helped to bring the idea of comics into the realm of serious literature. Both of these stories also earned screen adaptations. It was in 1989 that the first Tim Burton Batman premiered. Though not a direct take on the comic that was used for source material, there were a number of ideas (primarily the Joker’s origins) that came from that comic. The film, The Watchmen, directed by Zack Snyder, premiered in 2009. This film followed the source material almost exclusively. With that information out of the way, what we are going to be looking at is the connection between The Watchman graphic novel and the movie and maybe a little bit more. I give you warning… there will be spoilers ahead. The material is old enough that I would imagine if you were concerned you have had more than enough time to get up to speed already. But at the same time, I am hoping that some thoughts and ideas expressed will spark a conversation or two so it is a good idea to have a common understanding anyway. Now, when I say that the movie follows the source material of the comic almost exclusively, I mean for the most part, everything you see in the movie follows the same lines as the comic. There are some minor changes throughout and a few major changes but the ideas and such are almost identical. It is the differences that give us something important to talk about as far as the two delivery systems are concerned. The movie has been chided by comic fans for some of the changes. It’s understandable, we all want the movies to more accurately reflect the pictures and stories that remain in our heads. But this isn’t always possible based on technology within film and in some cases just the crazy ideas that can be seen and described through words and drawings. For many years we have been faced with specific limitations within technology. This is the point where the first difference arrives between the stories. Though both appear to follow a certain viewpoint throughout, the comic has a much different view point than the movie. The movie is almost exclusively viewed through Rorschak’s viewpoint. He is the main character (with side characters and their own stories). From what we understand at the end we are seeing the world through his journal and it is through his eyes that we see the world unfold. We are limited to a mostly linear story that is based on someone who is stuck in the dimension of time. The comic at a glance appears to be similar to this. The same flow is present but it is only through digging deeper into the comic that we see something completely different. The comic is shared with us through the viewpoint of Jon (Dr. Manhattan). As we see in the story he is outside of time. He lives through the entire timeline simultaneously. Throughout the entire series we are taken through different time periods and moments and are shown the story without the impediment of linear thinking. This change in viewpoint is the sticky widgit of the movie. If you were never to read the comic it wouldn’t be something you even notice. But when you view the two side by side it shows almost a completely different story. It is this distinction that makes sense when you consider a number of the other changes. Throughout there are moments that certain actions and conversations seem out of time, like they happen before or after they should have in the comic. Because the movie is written through a linear perspective these changes make perfect sense. The beginning of both the comic and the movie starts with the death of the Comedian. And in both much of what happens revolves around the mystery of who killed him and why. But again we are faced with the change in view point. In the movie we live through the battle that kills him. While in the comic we experience the death as the police investigators are exploring the scene. The scenes are essentially the same, but the order in which we see it all happen is reversed. This would seem like a minor thing but it is the difference of what we can do with film and what we can do with the printed page. These were changes based on the technology and how they could be used to convey the story. Another big point of contention is the ending. For the most part the ending has the same results between the two different versions. But how this is achieved shows the difference in expectations. In the comic it is through the guise of alien invasion that we find mass death and destruction. It’s silly, it’s stupid, it’s a comic book. Comic readers have come to accept stuff like this since the dawn of the comics they know and love. Seriously, Superman is an alien story (and the first true super hero comic book). At the time, dealing with the cold war and nations on the brink of nuclear fallout it helped to take our minds away from many of the horrors we faced in the real world. Move that forward into 2009. The cold war is over. Maybe this is a time when we can look back on the massive growth of the military and the threat of nuclear winter and not be sent into hysteria. They used the nuclear option for the movie. The thing is, the movie, just like the comic was heavy. The gritty noir feel of both broke boundaries of what can be considered comic entertainment. Where in the comic the whole idea of the alien invasion can be a plot device that will relieve a little tension at the same time as showing the death toll. In the movie that might actually have taken away from the power of the scenes surrounding the death and destruction. The end results were essentially the same. I admit that I remember when the comics first came out. At the time I hadn’t read them, actually, I hadn’t read the comics until this week. I picked up the graphic novel and poured through it all. The movie though, ya, I watched it several times before now. I even watched it again today before I sat down to write this. Either one is worth your time. Hell, I say go through all of it and really enjoy the experience. The graphic novel has histories spread throughout that detail the heroes and the world they live in. This is stuff you won’t find in the movie. I didn’t touch on this within the stuff up top because it is something the movie completely lost. Throughout the comics there is a secondary story running. It is a pirate story that seems to have no connection within the main story at all, at least until the very end. This story is depicted in Tales of the Black Freighter. When Alan Moore and Dave Gibbons came up with the preliminary idea for these stories they were limited by the idea of who all they would end up having to kill off. At the time, it was unheard of to kill off main characters and villains in comics. They eventually had to use some heroes that were licensed specifically for this series. This is important in comic history because it marks a turning point in the thoughts and the way comics were treated. It was another nail in the coffin of the Comics Code Authority. Now I would leave a few links on places that you can find the comic or the movie but really, at this point you should know where they are available. So I am going to just leave it at that. Go to Amazon and what not, you can find them there as well as more stuff that ties in with the stories. 2 Responses to "Never Trust a Comedian"
Pretty much what I am going for but I don’t want to sound all high brow. I am also adding in more personal conjecture so it is my hope that these don’t all feel like something done in a classroom environment.